A report prepared on groundwater management and ownership and released by the Planning Commission has recommended cooperative management of groundwater by its users, but did not address contentious issues such as pricing of groundwater for industrial and commercial units. The findings will be used by the commission in formulating the roadmap for water resources in the Eleventh Plan (2007-2012). “Since groundwater management is best done at local levels, the report has recommended empowering panchayats to lead the initiative to monitor its optimal use. Besides, the report has suggested creating a consensus among all users on restricting over use of groundwater," said Kirit Parikh a member of the commission. 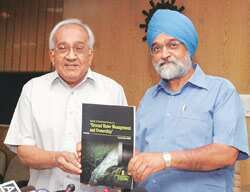 Parikh, who also chaired the expert committee that prepared this report, noted that since over 80% of groundwater in India is used by agriculture, the report has largely concentrated on its rational use by that sector. Groundwater comprises 39% of available water resources in the country and is free as it can be accessed by boring a tube well. It meets 55% of irrigation, 85% of rural and 50% of urban and industrial water needs. With 19 million wells in the country, the report has recommended empowering panchayats to organize village groundwater cooperatives to monitor sustainable use of such water. The report also suggested that the Central Ground Water Board should monitor depleting water tables, and that state groundwater boards should act as a facilitators in this process. As an incentive for farmers to rationalize the use of groundwater, the report also recommended that they be given upfront energy units at a fixed cost to run pump sets which generate groundwater. It has suggested that Rs6,000 be given to each farmer at a price of Rs2 per unit of electricity. If the farmer pumps in lesser amount of water than the stipulated 3,000 units, the balance amount can be retained. “Farmers will be incentivized to use less amounts of groundwater through this process and we feel this should start as a pilot project in some areas," said Navroz Dubash, associate professor at Delhi-based Jawaharlal Nehru University and also part of the expert group. The cost of extracting groundwater for agricultural purposes currently is extremely low as farmers are subsidized for setting up pump sets for this purpose. While the report recommends separating agriculture pump feeders from household pumps, it does not talk about a concrete pricing policy on groundwater usage. Water experts feels that the report should have taken into account over-exploitation of groundwater for commercial purposes and also lay down a pricing policy. “Recently the ministry of water resources has come out with a report on industrial use of groundwater and how it should be priced. I am surprised that Planning Commission will use this report for Elevent Plan but has not discussed the pricing issue," said a Delhi-based water expert who did not want to be quoted. He also said a proper regulatory mechanism should be developed in order to make the optimal use of groundwater a reality.